The Digital Research Library of Illinois History Journal™: The History of Fluky's Hot Dog Stands & Restaurant in Chicago, Illinois. 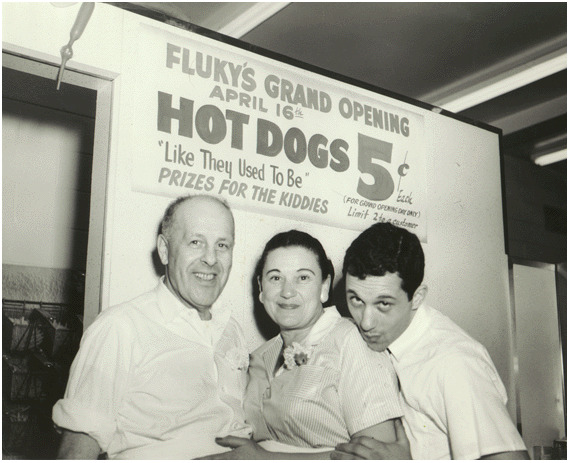 The History of Fluky's Hot Dog Stands & Restaurant in Chicago, Illinois. 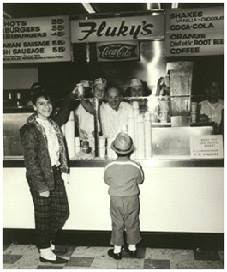 Fluky's founder Abe "Fluky" Drexler first started in 1929 on Maxwell and Halsted Streets in Chicago. They carried all the character and romance for which Chicago Street Merchants were famous, and Fluky's reputation as having the best "Hot Dog" in the city started to grow. In 1932, a second Fluky's was opened, and then in 1935, a third and a fourth in 1936. Fluky's became known for its "Depression Sandwich" - a hot dog with mustard, relish, onion, pickles, pepper, lettuce, tomatoes and French fries FOR ONLY 5¢! The "Garden on a Bun" was the depression sandwich without the hot dog and cost only 2¢. Fluky's reputation was built on good food, good service and good will through the hard times of the depression. Many youngsters and adults who didn't have the nickel were fed anyway. With the coming of World War II came meat rationing. This made it difficult to get the quality product Fluky's needed, and within a short time, Fluky's closed its doors at three of its locations and the fourth was the only store that was to continue until 1955. 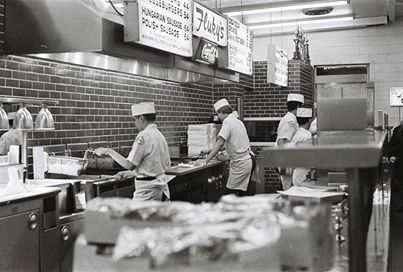 On February 18, 1964 Fluky's again opened its doors, after 9 years of silence. The opening was greeted with a tremendous outpouring of warmth and fondness from thousands who had many fond memories. In just a few months, Fluky's was the largest Hot Dog stand in the Chicago area. Except Fluky's was no longer a Hot Dog Stand. 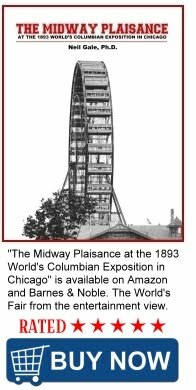 It was now housed in a large glass-enclosed structure, previously unknown in the Hot Dog industry of push-carts and street stands. Fluky's had made a giant step toward upgrading the Hot Dog business. The new building was on the west side of Western Avenue at 6732 North Western Avenue in the West Ridge community of Chicago (not in Rogers Park). There was a long thin counter at the very large windows to stand and eat which faced Western Avenue. In 1998 Fluky's move to the east side of Western Avenue at 6821 N. Western Avenue in the West Ridge community of Chicago, where the new location offered a drive-thru. Fluky's closed on February 13, 2006. Abe Drexler's son, Jack opened a Fluky's in the Wal-Mart at 5630 W Touhy Avenue, Niles, Illinois. Many say that it is not the same. Perhaps they are just being nostalgic. Your comments are welcome. Let's not forget the Hot Dog Gum given with counter orders. Loved Fluky's. The new store on Western was great and real fancy for a hot dog stand. The women that worked there were still giving me hot dog gum even as an adult just as they did when I was about 5. To bad the family lost interest in running the place. 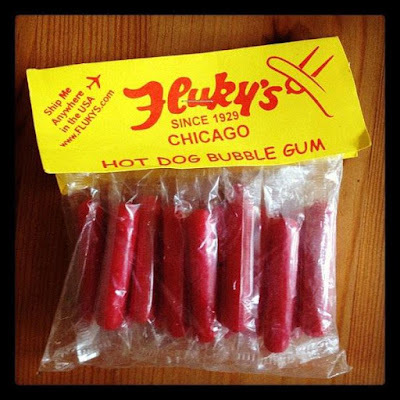 I grew up in Rogers Park and with Fluky's. So did I and I will never forget the original one when I wasn't tall enough to see over the counter to order at first. As time went by, I was and then we moved out of state. Came back and they had moved across the street! But they still had some of the same employees and the hot dog gum! Fluky's on Western & Pratt was my very first job in 1965. Since I lived down the street at Campbell & North Shore it was pretty convenient for me. My first job, too, and around the same time. Also lived on Campbell, near Peterson Avenue. Grandparents lived on 6700 block of Campbell, near Fluky's. I agree. Fluky was a really nice man. I worked for him for a few years when I was young. He taught me a lot. BTW, his name was Abe Drexler. Hi Neil, I think what they were saying is that Fluky's last name is 'Drexler' not 'Drexle'. Nice article. Thanks for the memories. Yep... Typo fixed. Thank you Jason. Yes their last name is Drexler. Jack ran the location on Western. Fluky liked to welcome everyone! 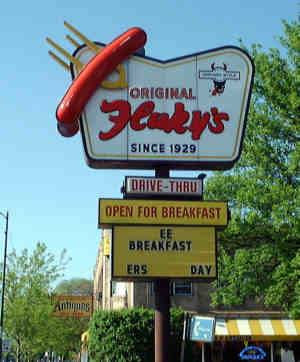 I've tried both Fluky's in Rogers Park (1980's) and the one in Walmart in Niles and I agree they are not the same Rogers Park was by far the best and I thought it did really well considering it was pretty much across the street from McDonald's. When Fluky's first opened on Western not a whole lot of people knew about it. When he had his Grand Opening some time later, everyone knew about it. Mr Fluky used to always go to my sons school, Decatur Classical on Holloween and he would bring his hot dog wagon. It was great!!! I also used to go to Flukys when it was on the other side of Western Ave.with my Dad and sister. Always went there in my childhood, and then in my adulthood. I too worked at Fluky’s, but the story fails to mention the Northbrook location we opened in the 1980’s. I have fond memories of those days. Enjoyed working for Jack and Alan. I now own my own Vienna Beef Hot Dog place in Florida. Wish I knew who this was! Would love to visit when I come down to Florida! Why Chicago has Multilevel Streets. John Kinzie, one of Chicago's Founding Fathers.